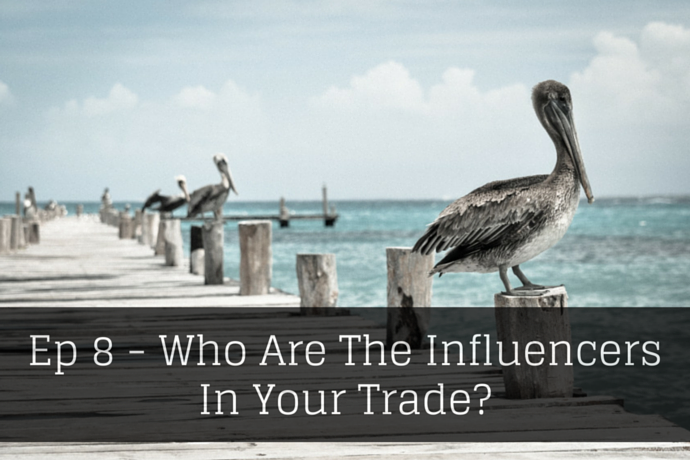 Who are the influences in your trade? What I mean by that is do you know who are the main people in your trade? Whether it’s local or whether it’s national; who are the influences? Now for most of us, other people in our trade means competitors but something I learned a long time ago when I joined a fire trade association back in the good old days when I had Triangle Fire Protection was that, all those people that I regarded as competitors, actually turned out to be colleagues. They’re not competitors. We helped each other. We talk to each other. We finally have someone with something in common that we can talk to. Quite often when you go home you talk to friends down the pub or your spouse – they will listen but do they really understand? No possibly not! But people in your trade do. Now who are the influencers, though? Of course there’s a lot of people in the trade but who’re the important ones? If you can get to know them, they have the best information. They can probably give you a lot of help. They can tell you what they did to get where they are. Obviously make friends, don’t make enemies, but don’t regard them as a competitor. They will help you and gradually you’ll find that their influence rubs off on you and you start to become an influencer. You’ll learn how they do it, what they do, who they speak to and you’ll start to get some of that effect. And what’s better than being the influencer in your trade or one of them? Now, you may say of course once I’m an influencer people will watch me and will copy me. But hey, copying is flattering – wonderful. What more could you ask for but customers want to know that you’re an expert? And when you are an influencer, you are an expert. I’m going to ask you who’s an influencer you’re going to look for the experts in your trade. Wouldn’t you want that to be you? Think about it! Find those influencers, make friends, don’t make enemies, ask them for help, learn from them, be them, work on it. It will help everything in your business and in your marketing. It will improve your future. Today’s friendly follow this Wednesday is a lovely lady from America called Chalene Johnson. Now Chalene is spelled slightly differently to normal but look her up at @ChaleneJohnson. She started as a fitness coach. She’s got a great story. She also has a podcast. Started as a fitness coach and made lots and lots of famous videos but that business has been sold to BeachBody for a successful amount and she now advises on improving lives in business and organizing and getting things done. But she has a great way of presenting and great empathy and she’s a kind person. And the way she puts things out it’s not usually about her. So, the reason I say to follow is to watch how she does it, learn from her. She has a huge followings on social media and it’s not a fluke. She works on it, she knows what she’s doing so look at her feeds in Twitter, try and get to know her. Look at her in Instagram, look at her on Facebook. She’s very, very good. Well worth your time. As usual the good folk at Rainmaker are the sponsors of the Marketing For Owners podcast. You will find the details at bit.ly/mfo-rain. The MarketingForOwners.com website runs on RainMaker. What more can I say? Go to the website look at every single page of what they can do for you and then think about it. Perfect investment. Well worth the money. Save you a fortune in the long run. That’s it for today. I hope you have a good Wednesday and I look forward to seeing you tomorrow morning. And, don’t forget to subscribe.